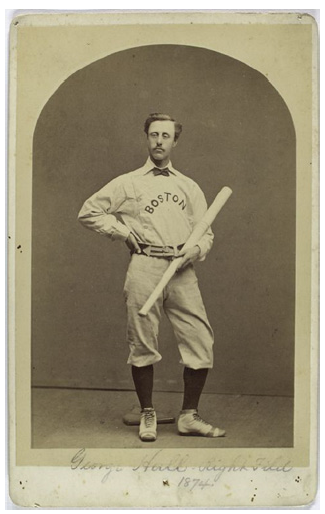 June 14, 1876: George Hall gets five hits, but is it a cycle? The first official cycle in the major leagues was accomplished by Charles Joseph Foley (also known as Curry Foley) of the Buffalo Bisons in a May 25, 1882, National League game against the Cleveland Blues.1 The two teams met at Riverside Grounds, the home ballpark of the Bisons. Because of cold weather, this rare achievement was witnessed by fewer than 1,000 fans, but by every account Foley collected a single, double, triple, and home run in the game. However, George Hall, an outfielder for the Philadelphia Athletic Club, may have hit for the cycle six seasons before Foley. 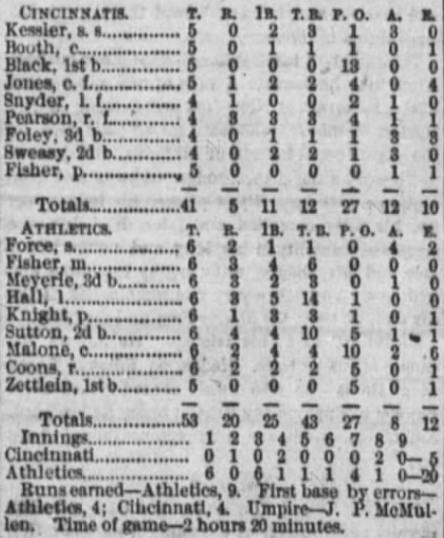 In the first of a three-game series that “resulted in a complete success for the Athletic,”2 the Philadelphia home team defeated the visiting Cincinnati Red Stockings, 20-5. According to the Cincinnati Enquirer, the Red Stockings “collided with the Athletic Base-ball Club, and before they got out of the catastrophe the damage was distressing.”3 Although lots of runs were scored, the defense in this match was sloppy on both sides. The two teams were playing each other for the first time in this, the inaugural season of the National League, and the game had been delayed for one day, because of rain. The estimated attendance was 500.4 Philadelphia’s team entered the contest with a 5-15 record and had won only once in its last 13 games. The Cincinnati squad “sported a balmy 4-17 record.”5 After a 3-2 start to the season, Cincinnati had lost 15 of 16 coming to the Jefferson Street Grounds. 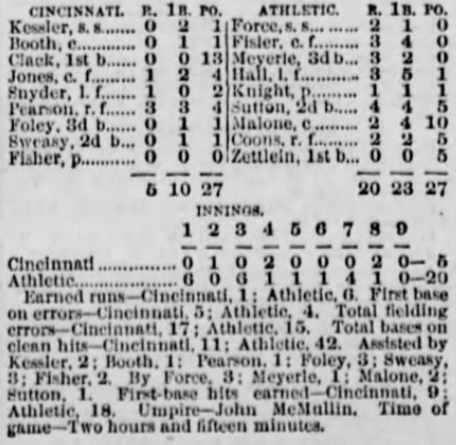 Cherokee Fisher took the mound for Cincinnati, but he was knocked around for 12 runs, prompting Amos Booth to come on in relief. However, when the Athletics rallied in the seventh inning, Fisher re-entered the game and “took the pitcher’s plate again.”6 Lon Knight pitched for Philadelphia, striking out seven and allowing but one earned run.7 George Zettlein came in to pitch the final frame for the Athletics, allowing one hit. Philadelphia scored six runs in the bottom of the first. The Athletics hit two triples in the second, but Wes Fisler overran the bag and was tagged out, and the Athletics were kept off the scoreboard. In the bottom of the third, the batting “was terrific, two singles, a two and a three-baser and a home run being the record.”8 Six more runs were added, giving Philadelphia a 12-1 lead. The Athletic team continued to pound the Red Stockings, scoring in every inning except the second and ninth. The story of the day was the batting of Philadelphia’s left fielder Hall. He hit a home run in the fifth inning and finished the game with a 5-for-6 performance. His possible achievement as the first batter to hit for the cycle is somewhat controversial. The Times emphasized that Hall was a star at the plate, writing, “One hit of Hall being to the fence at right field, the ball bounding over and giving him a home run. Besides this he had two three-basers, a double and a single.”11 According to the Philadelphia Enquirer, Hall “made the longest hit ever made on the grounds”12 when he knocked the ball over the right-field fence, but there is no description of his other four hits. (No box score was printed with the short recap of the game.) The Cincinnati Enquirer told a slightly different tale: “Hall picked up the bat only six times, but managed to baste the ball for fourteen bases.”13 That doesn’t quite jibe with the Times’s version, in which the five hits total 13 bases. The New York Clipper also reported that Hall had five hits, “once making a clean home-run by driving the ball over the right-field fence, and making, besides, three three-basers.”14 Only extra-base hits were listed by the Clipper, implying that Hall had a home run, three triples, and a single. This combination of five hits would total 14 bases (matching the Cincinnati Enquirer’s total), but without a double would not constitute the first cycle. It is difficult to know which newspaper account is the most accurate. All of them credit Hall with five hits, two of which were a home run and single. He had at least two triples. The Times specifically stated that he hit a double, but the Clipper reported three triples and no double. In an endnote in Hall’s SABR biography, Matt Albertson writes, “Major League Baseball Historian John Thorn agrees with the information provided in both the Clipper and [Cincinnati] Enquirer. The accepted first cycle in the major leagues was completed by Curry Foley in 1882.”15 What might complicate the issue is that the two newspapers not from Philadelphia are those that do not give credit for the double. As an aside, both baseball-reference.com and retrosheet.org (as well as other websites) credit Hall with accomplishing the first cycle. Three other Philadelphia batters had a good day at the plate. Fisler, Ezra Sutton, and Malone each had four hits in the game. For the Red Stockings, Dave Pierson had three hits and scored three runs. The two teams met again on June 15 and 17, and Philadelphia won both games, by scores of 11-6 and 23-15, respectively. The team’s winning streak was short-lived, however. Philadelphia lost 19 of its next 22 games. Cincinnati continued to lose as well. The Red Stockings posted a 13-game losing streak before beating the Athletics twice in early July. Then they proceeded to lose another 18 games in a row. The two teams finished the season at the bottom of the National League. Philadelphia’s record was 14-45 (with one tie), despite averaging 6.30 runs per game (third best in the league), while Cincinnati’s 9-56 mark was worst in the new league. The Red Stockings scored an average of 3.66 runs per game but allowed 8.91. The 5-foot-7-inch, 142-pound Hall led the circuit in home runs in 1876 with five, making him the first home-run king in the National League. He batted .366 in 60 games. However, he was involved in a scandal in 1877, accused of throwing games, and he was subsequently banned from playing in the league. There is one final note from the Times. Despite the multitude of hits and widespread poor fielding, “the umpiring was excellent, the best we have had this year, the judgment on balls and strikes being fair and discriminating.”16 Interesting choice for the last descriptor; the umpire was John McMullin. In addition to the sources mentioned in the notes, the author consulted baseball-reference.com, mlb.com, retrosheet.org, and sabr.org. 2 “A Game At Last,” Philadelphia Times, June 15, 1876: 4. 3 “Our Boys,” Cincinnati Enquirer, June 15, 1876: 4. 5 Matt Albertson, “George Hall,” SABR Biography Project, http://sabr.org/bioproj/person/82a2011a. 7 Lon Knight hit for the cycle on July 30, 1883, for the Philadelphia Athletic Club. Though no longer a pitcher, he played right field and managed the team. He was only the second batter to hit for the cycle, and he was the first player to hit for a natural cycle, meaning that he collected his hits in order of total bases (single first, then double, then triple, and then home run). 10 The Philadelphia Times lists 42 total bases, which the Cincinnati Enquirer lists 45. 12 “The Athletic Defeats the Cincinnati,” Philadelphia Enquirer, June 15, 1876: 2. 14 “Baseball: Athletic vs. Cincinnati,” New York Clipper, June 24, 1876. This source is listed in Hall’s SABR biography (see Albertson).